It's taken me quite a while to get into sushi. My first experience was about fifteen years ago, on my first dinner excursion with a new friend at work. Felicia was a foodie who wanted to share food experiences with me. I made my first pot of gumbo with Felicia and her roommate; they put so many chiles in it, it was too incendiary to taste. We'd also have a semi-regular afternoon tea with homemade scones and lemon curd. Had I not assumed this first sushi adventure was a fluke, I would never have shared another meal with her. My experience with Japanese food in the past had been limited to cooked items - tempura, tonkatsu, noodle soups, and teppanyaki. As a little girl, I always got a thrill out of those knife-wielding chefs who tossed shrimp at diners and set fires on the grill within a stack of onion rings. Sushi was still pretty alien to me - all I knew is that it was raw, and raw is yucky. My first taste of sushi did nothing to change this thought. Kawasaki, a fine Japanese restaurant that has been operating on Charles Street in Baltimore for decades now, was where I lost my sushi cherry. 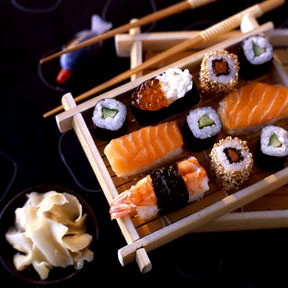 Felicia steered me towards a sampler of cooked sushi, as she knew I was not ready for raw fish at that point. My plate contained cooked shrimp draped over rice, a California roll, some inarizushi (stuffed tofu skins), and tomago (omelette over rice). All of it disgusted me. Both the inari and the tomago were sweet, and the nori wrapper on the Cali roll was both chewy and fishy. The pickled ginger was hideous, and watching F stuff pieces of it into her sushi rolls before popping the whole mess into her mouth made me slightly queasy. Then she gave me a piece of raw tuna to taste. I demurred, but she insisted. It was cold and too thick and I felt like I was chewing on my own tongue. I gulped my ice water to help me swallow the offensive matter and vowed never to eat sushi again. I actually had nightmares about the experience for many years. Seriously. Not long ago, I decided to give it another shot. Someone had advised me to try the eel, as it was cooked and served in a familiar teriyaki-flavored sauce. I tried, and I liked - very much. A Korean buffet that Neal and I like has a selection of simple sushi rolls and nigiri, and I tasted them at random over a series of visits. Not having to pay extra for them made me feel bold, and if I didn't like something, I could always get rid of the taste with a mouthful of bulgogi. Now, I occasionally crave sushi. I'm still not so much into the raw stuff, although I will eat it in or on a roll. Neal loves it, suprisingly enough, and always orders a selection of raw nigiri. Me, I'm all into the fancy rolls, and if they have the rice on the outside, and better yet, no nori at all, yum! And I still love the eel nigiri too. And the tamago and inari have grown on me as well, although I don't go out of my way to order them. And I love flying fish roe, but I've hated every other type of caviar I've encountered. Our favorite sushi restaurant is Yokozuna in Ocean City, Maryland. They are very expensive, and the sushi is small (true Japanese style, I would imagine...tiny and pricey), but the combinations are unique and the fish is always very very fresh. If you go there, make room for dessert - I order the Kahlua chocolate Bundt cake, which they serve heated, a good 4" slab of chocolately evilness, and Neal gets a bowl of green tea ice cream. Good separately, but fabulous together. Have I gone back to Kawasaki since that fateful tongue-chewing experience? Sure. They make yummy food. And I've even had sushi again.